Nat Sherman is one of the most well-known luxury tobacconists in the world. They have had a retail store and smoking lounge in New York City for 80 years now. 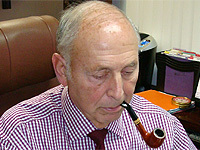 They are famous for their own brands of all-natural cigarettes, cigars and pipe tobacco. As soon as you walk through the front door you will see nearly 100 pipes displayed, as well as over 15 exclusive pipe tobacco blends. Here is an account of our visit to the store, including a video interview with Michael Holba, Retail Sales Manager. Nat Sherman is a world-renowned purveyor of fine luxury tobacco products. Their store in New York City is about to celebrate it’s 80th year. You will find all types of luxury tobacco, from the famous 100% additive-free natural tobacco cigarettes like MCD’s and Naturals, to premium cigars, and of course, pipes and pipe tobacco. 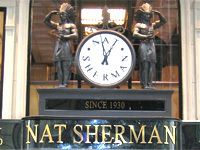 Nat Sherman is a family-owned and operated business currently headed by the namesake’s son, Joel Sherman. Mr. Sherman graciously took time out of his busy schedule to chat with us over the phone. Being a man of great experience and knowledge in this business, I decided to start out by asking him for a brief background and history of the company and how he has seen things change over the years.